Lulu De Vries has a rare form of cancer and has always dreamed of becoming a police officer. And for just one day that dream has come true. A mother from Norfolk says she won't live to 50 unless she can get cancer treatment in America. A mother from Hertfordshire has created a symptoms diary for bowel cancer which experts believe could save lives. 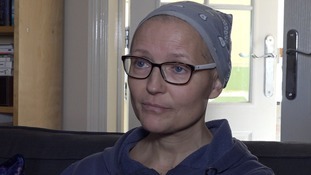 Tiffany Youngs has been speaking to ITV News Anglia reporter Raveena Ghattaura about her terminal cancer diagnosis and miraculous recovery. The event hopes to raise more than a quarter of a million pounds for Cancer Research UK. Norfolk County Council's leader has announced he is standing down with immediate effect - because he has lung cancer. Chris Powell is running the London Marathon next month in the name of cancer research. A mum from King's Lynn is on a mission to climb Mount Kilimanjaro - as a thank-you to those who helped her through breast cancer. Basildon and Thurrock NHS Foundation Trust said 2,500 samples were being re-screened. Once breast cancer survivor wants the cases and symptoms of the disease to be on the national curriculum.